A copycat killer on the loose? A murderer who must be caught! And when another murder takes place, Drake begins to question everything he knows about this case and his possible suspects. Now with his own reputation and the integrity of the Wales Police Service on the line Drake cannot afford to make any more mistakes. I have been a fan of Stephen’s books for a little while now. I can honestly say that there is not one book of his that I haven’t thoroughly enjoyed. I particularly have a soft spot for Detective Inspector Drake. I have been impatiently waiting for ‘Written In Blood’ for a couple of months now. Well the wait is over ladies and gents because ‘Written In Blood’ has just been released. I couldn’t wait to get hold of a copy to dive in. Oh my word, I absolutely loved reading ‘Written In Blood’ but more about that in a bit. What can I say about Inspector Drake? He’s a dedicated police officer, whose dedication to his work has seen his personal life suffer. He definitely puts duty before himself. I did think that perhaps his work/ life balance was a bit skew wiff and he needs to sort it out, otherwise somewhere down the line, he might burn out and I would hate for that to happen. Drake is something of a rare police officer, as he suffers with a mental health condition, Obsessive Compulsive Disorder. He doesn’t exactly shout about it from the rooftops or flaunt it but he certainly doesn’t hide it. Everybody he works with is aware of his OCD and if asked Drake is very matter of fact about it. When he is under extreme pressure or he is very upset, his OCD comes to the fore and he has a flare up. Drake works well on his own or as part of a team. He sounds to be a very fair person to work for – he will give praise where it is due but if a member of his team balls up then he will drag them over the coals in private. Drake wouldn’t ask anybody to do anything that he wouldn’t be willing to do himself. Drake gets on with most of his colleagues but there are a couple of them who grate on him. This has to be my favourite book of the series so far. The story hits the ground running and maintains the pace throughout. The crimes are gruesome in nature and will certainly stay in my mind for a long time to come. I found reading ‘Written In Blood’ to be extremely addictive. I would pick up the book only intending to read a couple of chapters, but that intention soon went out the window. When I looked up from the book to look at the time, I was surprised to realise that far from reading a couple of chapters, I had actually read nine chapters and the time was a little later than I thought. I had been enjoying the quality of Stephen’s writing, the story and the characters so much that I just kept on reading. ‘Written In Blood’ wasn’t exactly glued to my hand but it might as well have been because it came everywhere with me. I had to keep turning those pages to see what shocks and surprises awaited me on the next page and to see what fate had in store for Detective Inspector Drake. At one point the pages of the book were turning that quickly that it was almost as if they were turning themselves and before I realised what was happening, I had finished the book, which I had mixed feelings about. Don’t get me wrong I was pleased to finish because I knew how this particular case ended but I wasn’t pleased to finish because I was enjoying it so much that I didn’t want it to end. 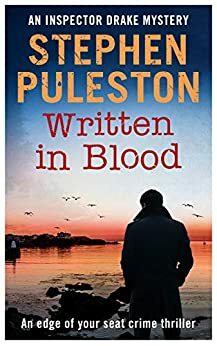 Reading ‘Written In Blood’ felt much like riding on a rather scary and unpredictable rollercoaster ride with more twists and turns than you would find on a Snakes & Ladders board. There were also times when I almost had to read through my fingers because I feared what was going to happen next or what was on the next page. Silly me though because I knew that if I wanted to know how the story ended then of course I would need to read on. ‘Written In Blood’ was one of those books that kept me guessing. On more than one occasion I found myself smugly thinking that I had worked out the culprit and his motivations only to realise that I was completely wrong. The main storylines are well plotted, well written and well played. In short I absolutely loved ‘Written In Blood’ and I wholeheartedly recommend it to other readers. I can’t wait to read what Stephen comes up with next. The score on the Ginger Book Geek board is a very well deserved 5* out of 5*.